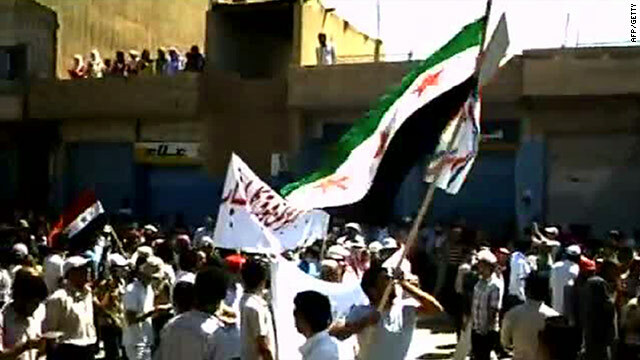 A video on YouTube shows Syrian anti-government demonstrators waving a flag in Qamishli on 26 August. (CNN) -- As reports of violent crackdowns on pro-democracy demonstrators escalate, activists say they are growing disillusioned waiting for the world to intervene on the crisis in Syria. "We would welcome and want the international community's support and help. But whether this is happening or is going to take place or not, Syrians are not backing down because we were disappointed again and again," Syrian political activist Ausama Monajed said. Unrest has plagued Syria for more than five months, as protesters demanding more freedom, democratic elections and an end to President Bashar al-Assad's regime have been met by brute force. More than 2,000 people have been killed in Syria since mid-March, the United Nations has said. But unlike with Libya, there is no international military intervention in Syria. One key reason involves the positions of Russia and China. Both countries have much greater financial and political ties with Syria than with Libya. As the international community seeks to impose U.N. sanctions on al-Assad, Russia is actively blocking a proposed arms embargo. China has threatened to do the same. The Arab League, which suspended Libya's membership less than two months in to the uprising, has also been widely accused of a sluggish response. Without as much international pressure to move on Syria as there was over Libya, the league's foreign ministers have just recently voted to send Secretary General Nabil El Araby with an initiative to end the violence. "As the reality of the events unfold and from the lessons learned, the use of security and violence with peaceful political movements is futile," said El Araby. "We should respond to these demands and speed up the implementation of reform projects that Arab governments announced and which is the safest way to ensure stability for our people. This will provide protection from foreign intervention, which often comes with its own agenda." Scattered reports have emerged of activists using improvised and automatic weapons to repel government forces. And witnesses who spoke to CNN from inside Syria reported previously unheard chants for armed resistance at Friday's protests. The Local Coordination Committees, an opposition activist group with a wide, grassroots network across Syria, also called for restraint, despite the possible temptation for Syrians to emulate their Libyan counterparts and take matters into their own hands. "While we understand the motivation to take up arms or call for military intervention, we specifically reject this position," the LCC said in a statement. Monajed said arming the opposition would play in to the hands of the Syrian regime. "The regime has been trying extremely hard to force the Syrian people into one of these two traps -- sectarianism or violence -- yet the Syrian people were, surprisingly, very much convinced that we should not fall into these two traps because it is going to be the scape goat of the regime." The Syrian president has always maintained that his government was facing armed gangs rather then an organized call for reform, a claim that human rights groups have called an "attempted whitewash." The U.S. Treasury extended sanctions Tuesday against three senior members of al-Assad's government -- Foreign Minister Walid Moallem, presidential adviser Bouthaina Shaaban and Syria's ambassador to Lebanon, Ali Abdul Karim Ali. The move -- the third round of U.S. sanctions against the al-Assad regime -- freezes any assets they may have in the United States and bars U.S. citizens from doing business with them. State Department spokeswoman Victoria Nuland called Moallem "a guy who we consider has been spreading untruth about the opposition in Syria, untruth about the security situation, untruth about the regime's activity and as such, has been misleading in his role as foreign minister." She noted that the United States has long called on Damascus to give up its arsenal of chemical weapons, but said there was no indication that it posed an immediate threat. "We do believe that Syria's chemical stockpile remains under government control and that there is no change in the lockdown status of those weapons," Nuland told reporters. "Syria has a stockpile of nerve agent and some mustard gas, and we will continue to work closely with like-minded countries to ensure that there is no proliferation of that material, as well." Meanwhile, the European Union's preparations for an embargo on oil imports from Syria were being finalized, and a ban could be implemented within days, an EU representative said. EU foreign policy chief Catherine Ashton issued a statement Tuesday expressing her "continued deep concern about the violence perpetrated by the Syrian regime against peaceful demonstrators, human rights activists and the Syrian people." She urged government security forces to stop their "brutal repression" of the Syrian people. CNN is unable to independently confirm death tolls in Syria, which has restricted access to international journalists.